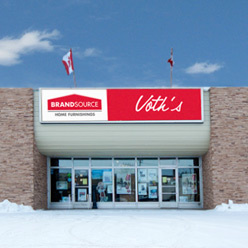 Voth''s BrandSource Home Furnishings has everything you need to make your home stylish and comfortable. In our spacious 10,000 sq. ft. showroom you’ll discover a huge selection of electronics, furniture, appliances and mattresses. Along with a superb product selection, you’ll find knowledgeable sales people who can help guide you in the decision process in a relaxed, pressure-free environment. And at Voth’s BrandSource Home Furnishings, you’ll never pay more because, as a member of BrandSource, and Audio Video Unlimited, we posses a combined purchasing power of over a $11 billion making our pricing every bit as competitive as our big box competitors. Plus, unlike our big box competition, we offer personalized service before and after the sale, professional delivery, installation and repair.